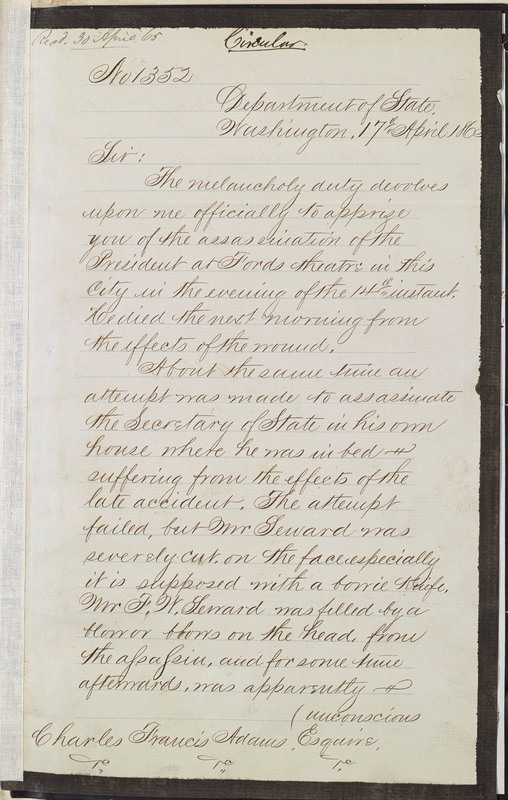 Official dispatch from William H. Hunter to Charles Francis Adams, U.S. Minister to the United Kingdom, informing him of Lincoln's assassination and the attempt on Secretary of State William H. Seward's life. Hunter notes that William and Frederick Seward are both expected to recover, but that, in the meanwhile, Hunter is serving as Acting Secretary of State. Because the Transatlantic telegraph cable was no longer functioning, Adams received this dispatch on April 30.
city in the evening of the 14th instant. the effects of the wound. it is supposed with a bowie knife.